Miriam Cain of Camper & Nicholsons tells me that Charles Ehrardt in Antibes has just seen a major reduction in the price of his central agency, Heesen's 39.8m superyacht Jangada. Delivered by the Dutch yard in 2001, she's a full displacement yacht with a steel hull and aluminium superstructure, powered by twin 850hp Caterpillar engines. Jangada accommodates eight guests in four staterooms and has a large garage for her tenders. 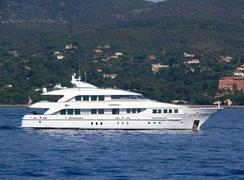 Currently lying in La Napoule, France, her asking price has been slashed from €12.7 million to €9.9 million.